This section describes the exercise of studying and drawing action photography! Using your sports magazines as a source of photographic models, you will begin to study the cylinder bodies and surface details the human figure in motion. Get your sports magazines out, and find a picture to study. Now, add surface detail over the cylinder body framework. 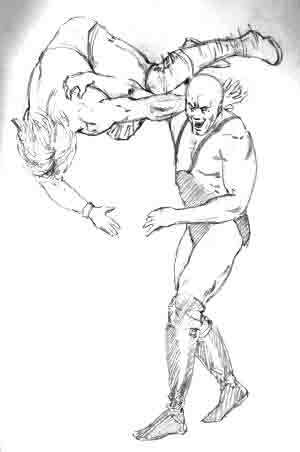 Here's a drawing of one wrestler throwing another wrestler. Note that the figures are well proportioned and balanced -- that is, it's cylinder body structure is in place. We're pushing our cylinder bodies into more energetic poses, and that translates into the "energy" of the drawing! 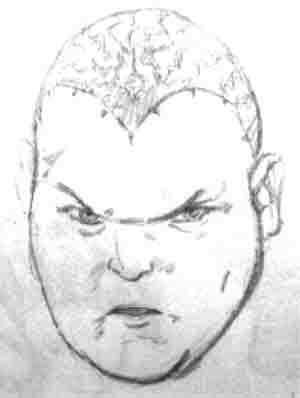 Note also the attention to surface detail, especially the hair (or lack of it!) and the wrinkle patterns in the boots. Notice how boring the costumes were 13 years ago!?! Notice the relative sizes of the two wrestlers -- can you tell who is taller? Figure balance and structure, relative size, and movement are all represented. 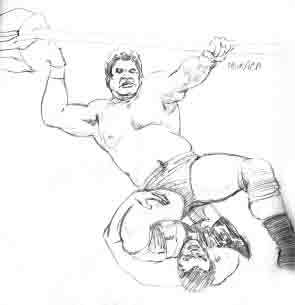 Notice the foreshortening (perspective) of the upside-down wrestler's legs, and the subtle curve of his feet? Bam Bam Bigelow is stopping by to make sure you are doing the cylinder bodies for all your figures! And you better do them, 'cuz he makes Butterbean look like Mini-Me!! Notice the foreshortening (perspective) of one of each wrestler's legs, and of the choked wrestler's forearms? Figure balance and structure, relative size, and movement are all represented here. Yes, you heard me! You can find athletes in many sports -- you don't have to limit yourself to contact sports! Can you recognize this athlete? Figure balance and structure is CRITICAL in a shot like this. Notice the attempt to capture the smoothness and power in the swing through a smooth body-line and divot debris! Yes, you heard me! You can find athletes in many sports -- you don't have to limit yourself to contact sports! Figure balance and structure is CRITICAL in a shot like this. Notice the attempt to capture the quickness of the player and ball by blurring the racket and ball? So that's all there is to Action Studies! I have many more such illustrations in my sketch books -- and you should, too! This is a great way to learn the human body in action -- from REALITY! Now that you are getting the handle on drawing the figure in action poses, why not go onto the next section and try your hand at some Bigger-Than-Life Action Shots!